Enjoy Adventurous Hikes not possible from the Rim Hotels with Copper Canyon Trails. With 6 people, book your dates! Experience multiday - and multi-night - adventure in Mexico's wild Sierra Tarahumara. We offer camping/hiking trips and backpacking for all skill levels. 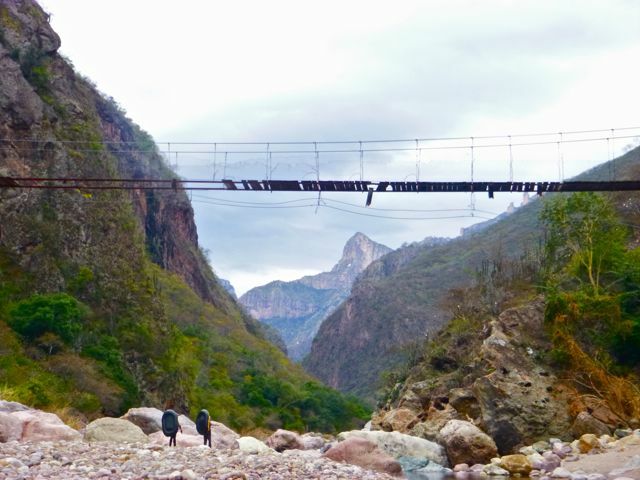 Check out our signature 10-day Tour from Los Mochis Airport, with Burro Supported Trekking (6 Days Hiking/5 Nights camping) into the Urique River canyon system. Our little burros rented from the local serranos and Tarahumara make our group fully self sufficient.The camping portion includes challenging day hikes in the canyon between the canyon rim and the river that are impossible to do by day hiking from the rim alone. A variety of hiking options will challenge the most experienced hikers. We carry roomy expedition tents, and a fully stocked kitchen complete with a camp cook! Our attentive crew will even deliver your duffelbag to your tent, and serve locally sourced margaritas during happy hour?! This package includes first class round-trip on North America’s Premier Rail Journey the Chihuahua al Pacifico (ChePe). This train route from sea level to 8000 feet in barely 6 hours is the equivalent in terms of biodiversity of driving from the tropics to southern Canada. At the time of its commission between the deep water port at Topolobambo, Sinaloa, and Presidio, Texas, the route was an engineering marvel utilizing 86 tunnels and 36 bridges. Also included are four nights hotel accommodations, and all transfers between airport, hotel, and train stations. Make plans to join the expedition!! Alternatively, arrive at the canyon rim by car or bus to begin your 8-Day Tour. The train stop Estación Divisadero on the canyon rim is 10 hours by car from El Paso, TX, or Douglas, AZ, and barely 5 hours by bus from Chihuahua. Other trekking options include a burro supported hike to the Town of Urique, location of the yearly Caballo Blanco UltraMarathon (5 nights camping), or be a part of the cultural celebrations during Semana Santa - Easter Week. All of our offerings and lots more are available as a backpack. Consider suffering through a classic 6-day Rim to Rim to Rim Backpack with multiple river crossings and 20,000 feet of elevation change. We offer several self-supported backpacking trips. Backpacks are more like a "no pain, no gain" experience. All backpacks are custom designed. We have a number of trailheads in the area from which to choose. The hikes are more demanding, but allow passage through some routes too difficult for burros. The routes and level of difficulty can be tailored to your level of experience. Novice backpackers need not worry, though. You don't have to get far away from the crowd to enjoy the splendid natural environment and tranquility that the canyon country has to offer. We'll even help you choose a new route, if you've been here before and want to expand your repertoire. If you're short on time, but have the desire and stamina, we can fulfill your most aggressive itinerary. 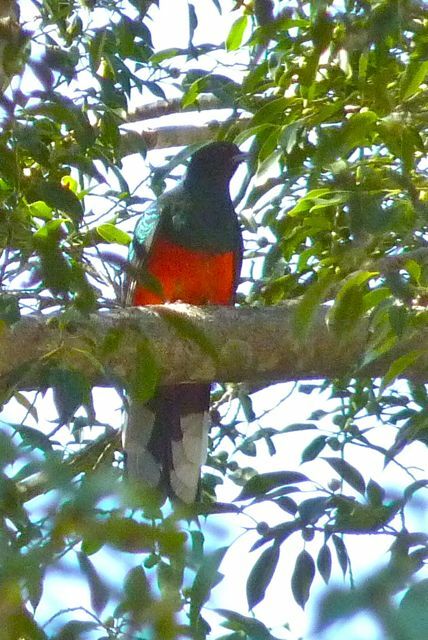 Or if you're looking for peace and solitude, birdwatching rare species at the extremes of their range, soaking in hot tubs miles from the nearest road, or discovering waterfalls during the rainy season, we can make your dreams a reality. Contact us to customize a trip. Copper Canyon Guides along the Rio Urique. 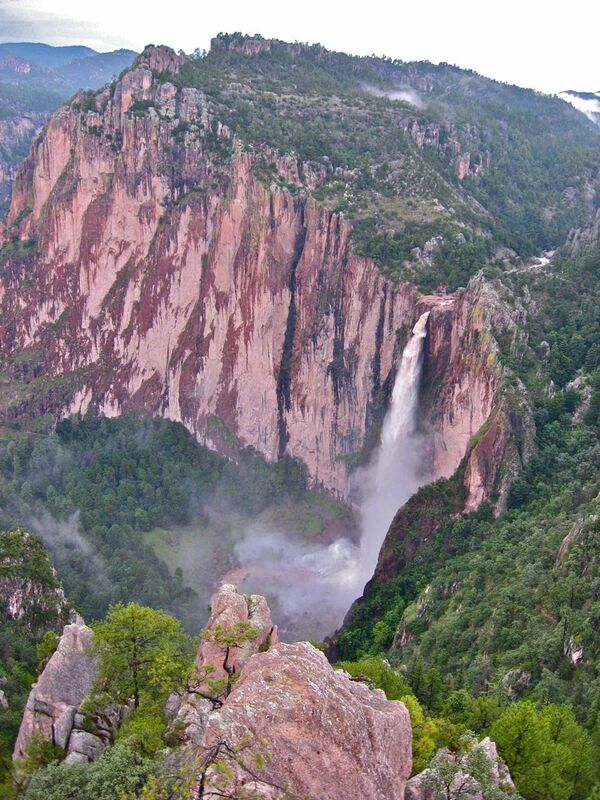 Also known as the Sierra Tarahumara, this deeply fissured country boasts some of the deepest canyons in North America. In fact, if you're considering a trip to Las Barrancas, consider hiking Arizona's famous Grand Canyon as a great warmup! If so, also consider hiring one of our guiding buddies from All Star Grand Canyon Tours or Wildland Trekking to maximize your experience. 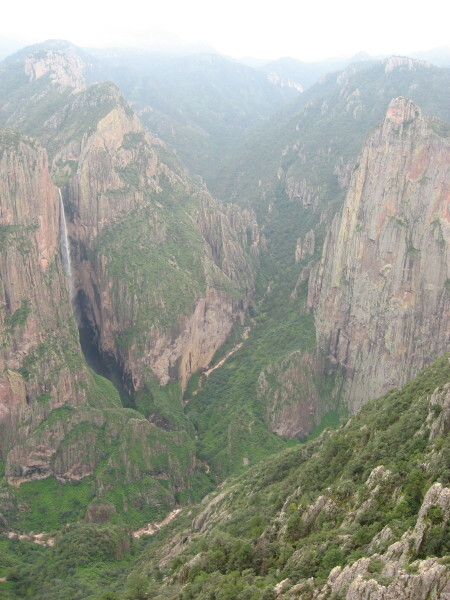 The Barranca Candamena in Chihuahua is home to Mexico's highest, and third highest waterfalls. Piedra Volada, Mexico's highest waterfall at 1200 feet (365m) was only brought to the attention of the outside world in 1996. Unfortunately, these treasures of the Sierra Madre is not part of our basic itinerary, but you could (and should) extend your trip a day or two to see them. It's almost 4 hours away by twisty mountain roads from Divisadero, and 3 from Creel just to the lookout. Most hotels can easily arrange a day trip. You'll need a hiking guide to get further afield. A network of trails cross this vast area, leading past ruins of mining camps and abandoned bridges not maintained since the heyday of the mule trains carrying silver bullion. It would take a lifetime to know the whole area, but we employ local guides who are intimately connected to it all. From their perspective, we get a rare insight into this fascinating environment. By request, we also offer an "11 day road trip" combined with a 5 day burro trek, or opt for day hikes only with an "8 day road trip" from the Tucson airport. See ruins, waterfalls, and local flora and fauna from the tropical to the temperate, and visits to the best that Chihuahua has to offer. Whether you're looking for camping with challenging day hikes, backpacking, ruins, indigenous culture and crafts, or canyoneering, Copper Canyon Trails can create the itinerary! We camp out, or stay in rustic lodges. Accommodations may be spartan as much of the region is without electricity, but the meals are filling and the locals are friendly. We may experience remote ranch life for some meals. Group size is from 6 to 12 clients, always with 2 English speaking guides. Small group size gives us the opportunity to maximize your experience and minimize our impact. Backcountry meals are typically prepared using local ingredients as available. 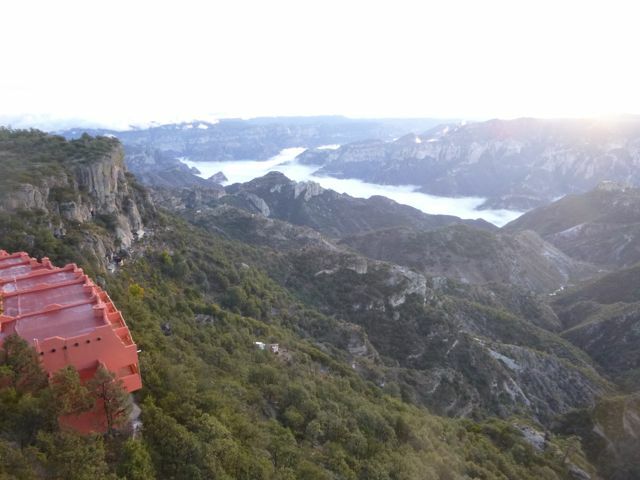 A Rare Fog Bank Highlights the Features of the Urique Canyon a Mile below the Canyon Rim. but to travel over them is exhaustive to muscle and patience. is a constant and severe strain on your mind. CONTACT Us to customize your trip with regard to your schedule, itinerary, pocketbook, or other specific needs (corporate retreat, team building, skills enhancement). We can work with you to maximize your time in the canyons. DON'T forget to include a Baja bound ferry at the end of the trip, or a second night in the colonial town of El Fuerte. Shoestring travelers joining us at the canyon rim can greatly reduce the trip cost. 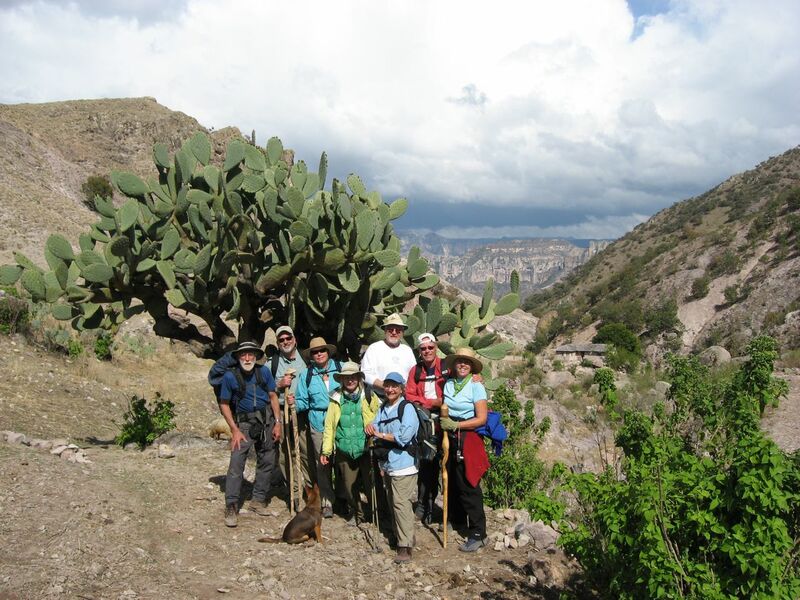 Copper Canyon Trails is recommended by the definitive Mexico travel guide, Carl Franz' People's Guide to Mexico. We recommend this timeless travelbook not only for its perpetual usefulness, but for its entertainment value in reliving the pitfalls of a savvy gringo travelling in Mexico. Carl and his partner Lorena Havens have forgotten more about Mexico than most anybody will ever know, but they stay current and have a well used website where comments and up-to-date information are appreciated. Those concerned with indigenous rights, particularly with a hankering to run 30 miles or more for a mere gourdful of Tesguino, visit Norawas de Rararmuri, friends of the running people. We inherited our local burro crew from Gary Zeigler and Amy Finger of Adventure Specialists. They hired our guide's dads as their guides! Talk about family tradition. Gary, a world renowned authority on the Inca, and Fellow of the Royal Geographic Society, recently discovered the Inca city of Llactapata, greatly increasing our knowledge of the importance of the Machu Pichu complex. They offer personalized tours in the Andes. Copper Canyon Trails supports and works with Center for Biological Diversity. Their efforts to call attention to the fragmentation of fragile desert ecosystems have demonstrated the interconnectedness of diverse habitats; and Sky Island Alliance. Their pioneering efforts to document the larger habitats required for large mammals with the help of citizen-scientists have produced data that is used to establish wildlife corridors between distant mountain ranges; the "sky islands" separated by "desert seas". They have recently documented native jaguar hunting ranges as far north as southern Arizona. Please check out the websites of both of these worthy environmental organizations based in Tucson, AZ. We also support and admire NativeSeeds/S.E.A.R.C.H. For years this non-profit organization has maintained the integrity of distinct plant species in the Desert Southwest, including the Sierra Madre and the Colorado Plateau. In this GMO world when airborne pollen can compromise indigenous species, forever eradicating hereditary traits, this is an increasingly arduous task. Recently a seed farm has been opened in Batopilas to grow-out local seeds. Piedra Volada faces El Gigante in the magnificent Baranca Candamena. Mexico's Highest Waterfall is only Three hours by car from Divisdero, but consider Spending the Night at Rancho San Lorenzo. Currently the least expensive flights to LOS MOCHIS (LMM) are over $800 no matter how much shopping around you do. You can practically get to Amsterdam or Lima for less. Consequently, upon request we offer a van tours from Tucson with a minimum of eight passengers. Granted, Los Mochis arrivals have some benefits, such as experiencing El Fuerte (founded 1564! and arguably home of the famous Zorro), and riding the train, tied with the Trans-Canada as North America's best rail journey! The recently completed airport in Creel, Chihuahua, has yet to receive a flight. 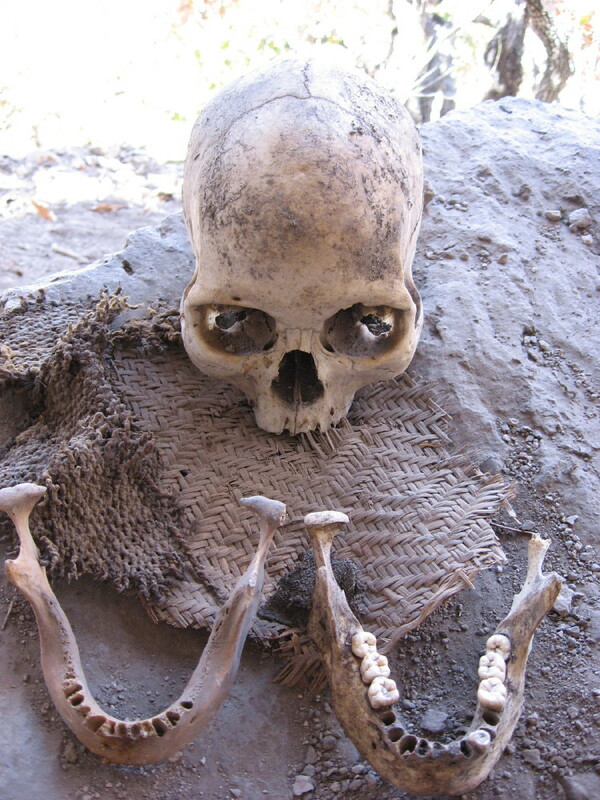 It is said the government negotiated with the Tarahumaran for land rights and has refused to honor their agreement. This may be true as the Divisadero train station has never opened after being designed to marginalize the Tarahumara craft market. Several US cities have service to Ciudad Chihuahua (CUU). The Chihuahua al Pacifico (ChePe) is the last passenger train in Mexico, the most spectacular rail journey in North America, and prices are rising more reliably than the NYSE. The best way to arrive is a morning departure from Los Mochis/El Fuerte. Book round-trip first class and print your tickets at home, or arrange your dates to take advantage of the "regional tourist" offerings and pay onboard. Our recommended itinerary is to arrive in Los Mochis by air, train to the canyon rim from nearby El Fuerte, and depart the canyon rim for Creel (45 minutes) or Chihuahua (5.5 hours) by bus. Early buses leave early enough to enjoy some of what Mexico's largest state capital has to offer such as the Pancho Villa Museum and the picturesque main square and cathedral, or use Creel to see another part of the sierras, such as Cascada Cusarare (35m) or Cascada Basaseachi (240m). Consider spending an extra day or two in the area to visit Mexico's "Yosemite Canyon'- Barranca Candameña, home to Cascada Basaseachi and Mexico's highest waterfall Piedra Volada (400m). Currently, there are also 3 buses daily to the Copper Canyon rim from Chihuahua City. If you don't want to miss any scenery, you can go overland. TUFESA Bus lines have an 8pm (2000H) departure from Tucson. It arrives in Los Mochis 12 hours later. An easy border crossing connection at Nogales, Sonora makes this a popular low cost choice ($120.00 USD). You'll have to get to the hotel in El Fuerte on your own, but it gives you a chance to see the old sugarmill town of Los Mochis. Los Mochis and El Fuerte hotel information is provided upon request. El Paso Greyhound can put you directly into Ciudad Chihuahua, with several daily connections to the end of the paved road at Bahuichivo via Rapidos Cuauhtemoc and Noreste for about $250MN (about $15USD in 2016); and two to Basaseachi. Some El Paso hotels have free airport shuttles. After the hike you can continue on, by train or bus, to Chihuahua City. The cathedral/central plaza area downtown is very picturesque. A popular zocalo with a centrally located gazebo is flanked by porticos. As sunset approaches, this area becomes a social center as prospective or perpetual couples make the paseo. There is a lot of revolutionary history in this town, and a Pancho Villa museum in a period palace called Quinta Luz. The actual car in which Pancho Villa was assassinated while driving thru Parral has retired here. RULE #1: Don't drive at night! There is too much that can go wrong. Ranch stock wandering around the roads in daytime is bad enough. If a logging truck breaks down, you know he's going to stop right in the highway. There's no shoulder. He might tip over if he did try to pull over. And don't expect blinkers or flashers. That wiring has probably been put to better use. Speed bumps aren't marked, and then there are pedestrians who are on the road because there are no lights at night and no shoulder. Remember Rule #1. There are convenient border crossings at El Paso, TX, Santa Teresa and Columbus, N.M., Douglas and Nogales, AZ. The canyon rim is at least 8 hours from the border crossing at Douglas, AZ, once you clear immigrations in Agua Prieta, Sonora, so start early. Watch out for a generous number of speed bumps (topes) once you leave the main roads.Driving Directions from Tucson. 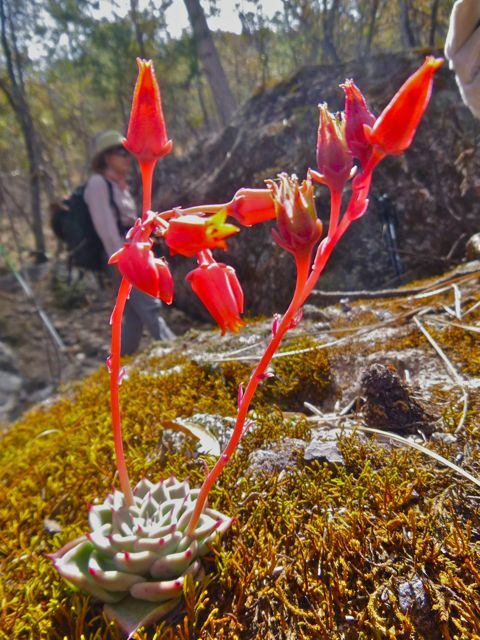 Escorted Hikes and Burro Expeditions in Mexico's Copper Canyon: Book One Now!